Mawsmai cave is situated around 6 kilometers from Cherrapunjee and is considered to be one of the most significant attractions of Cherrapunji. These caves are formed out of limestone and enjoy the distinction of being the only caves in Meghalaya that are lit enough so that the tourists can enjoy its natural formations with wonder. These caves are quite deep and long although you can only cover a distance of 150 meters inside them. The rest of these caves are closed for the visitors. The stalactites and stalagmites caves have innumerable forms, shapes and sizes inside leaving one to imagine as many life forms as possible. This magnificent natural wonder is the handiwork of years of natural abrasion and underground water. Do visit these caves if you are looking for something other than the open natural wonders in Cherrapunji. How popular is Mawsmai Cave? People normally club together Sa-i-mika Park and First Presbyterian Church while planning their visit to Mawsmai Cave. People also prefer to start their day with Mawsmai Cave. 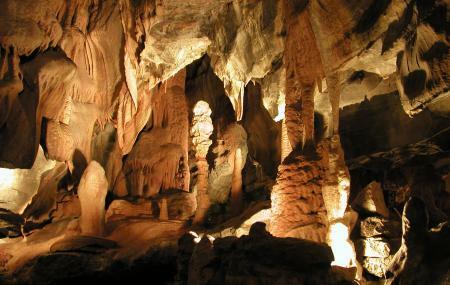 Mawsmai Cave is a natural place which is very famous among the tourists from home and abroad. The authority has maintained the place very well. But if you are not willing to walk a few steps upward then you shouldn't go there. Because you have to go top of the hills to view this magical cave. Amazing place.... You must be careful and mind the gaps. You can see mind blowing scenes. There is one entry only for professionals and explorers. ... That cave does not have lights so, plan accordingly. Wow.. It's a nice place. The cave is very interesting, it's little tiny in the middle of the cave but no need to fear slowly and gradually everyone gets through to it. We had enjoyed a lot 😊. This was an adventurous event walking side this cave. I can still remember how enjoyable it was. The smell of the stone, dimly light, and the echos of our voices made us feel like we were going through a real adventure. Anyone from child to old can go inside the cave as I have seen people of all ages there. There is car parking available. There are many restaurants available. There are also fee viewpoints available near the cave. One great experience. It's around 1km walk through the cave. It's damp and nest for bats in some dark corners. But the feel is different. The state tourism board have maintained it for tourist entry without damaging much of its feel. It is light enough to enjoy the cave.